It's been a LONG time since I have updated. I haven't done much work, but I have completed some minor projects such as installing the replacement dual horns, refinishing a wooden shift handle, and re-connecting some items that I never got around to. But to date, I've driven the car about 1350 miles. So far, so good. When I put the car together, I never had a chance to really test everything. I found out, after the fact, that the synchros for 3rd and 4th gear were either worn or cracked. This meant that shifting into third either up or down shift would grind, unless I did it slowly; which I always did. But recently I found a low mileage replacement transmission on eBay and purchased it. While I have everything out, this is the time to double check my gaskets, clean everything, touch up some paint and detailing issues, and replace some fasteners. 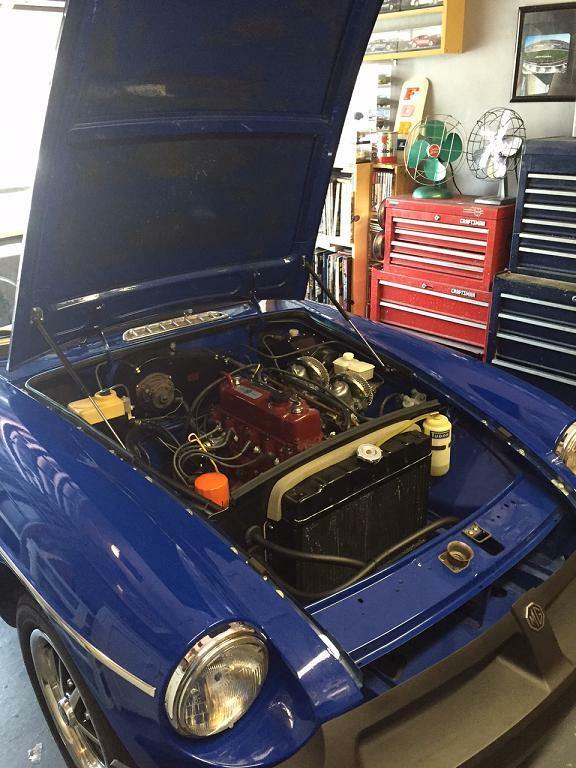 A few days ago, I started the process by removing the shifter, carbs, header, and other engine compartment items. 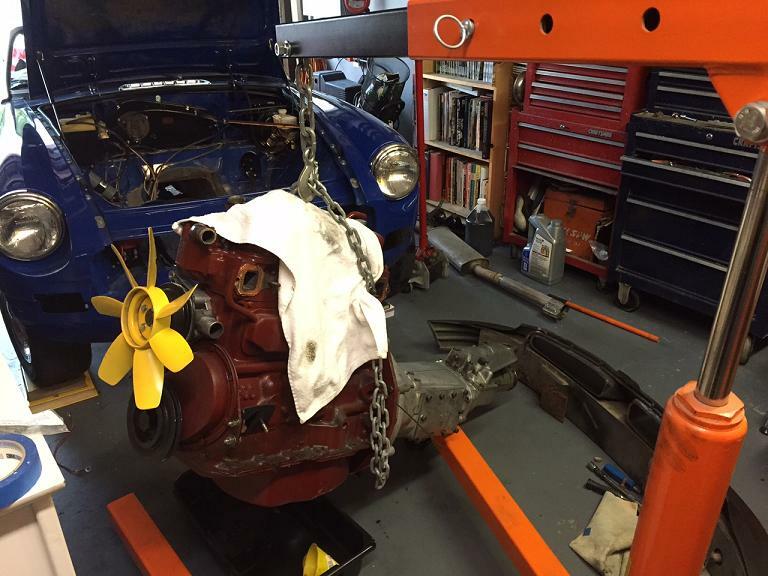 Today, I removed the drive shaft, unbolted the motor mounts and pulled out the engine and transmission as one unit. This is the first time I pulled them together, and luckily it went smoothly. The plan is to get everything cleaned and touched up. 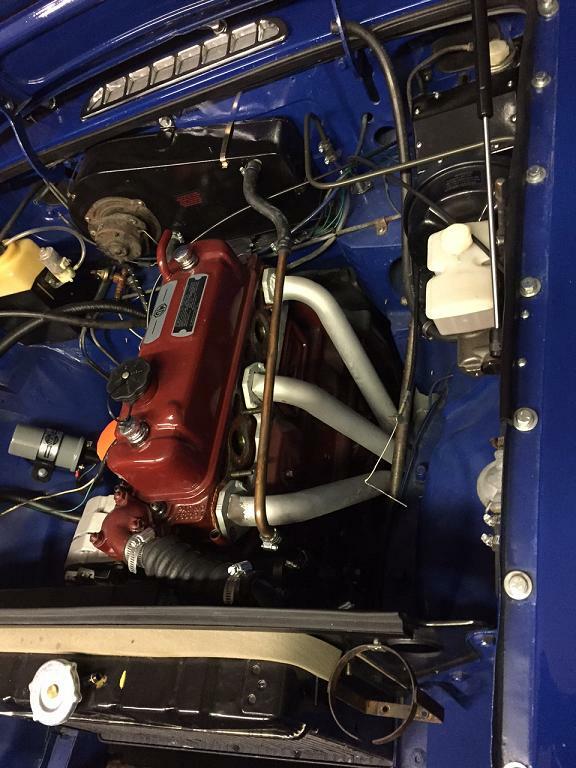 When re-installing, I have purchased a polished stainless steel exhaust system, from the header to the tail pipe, to replace the rusted and previously repaired and patched together system. I also purchased a steel braided clutch hose to replace the obviously perished one in the car. I will be transferring some items from the old transmission to the new one, such as the rubber boot and roller bearing throw out bearing, both of which have almost no mileage. I hope to have this car back together in September. The cleanup and touch up that I have planned will take more time than the actual removal and replacement. More to follow.